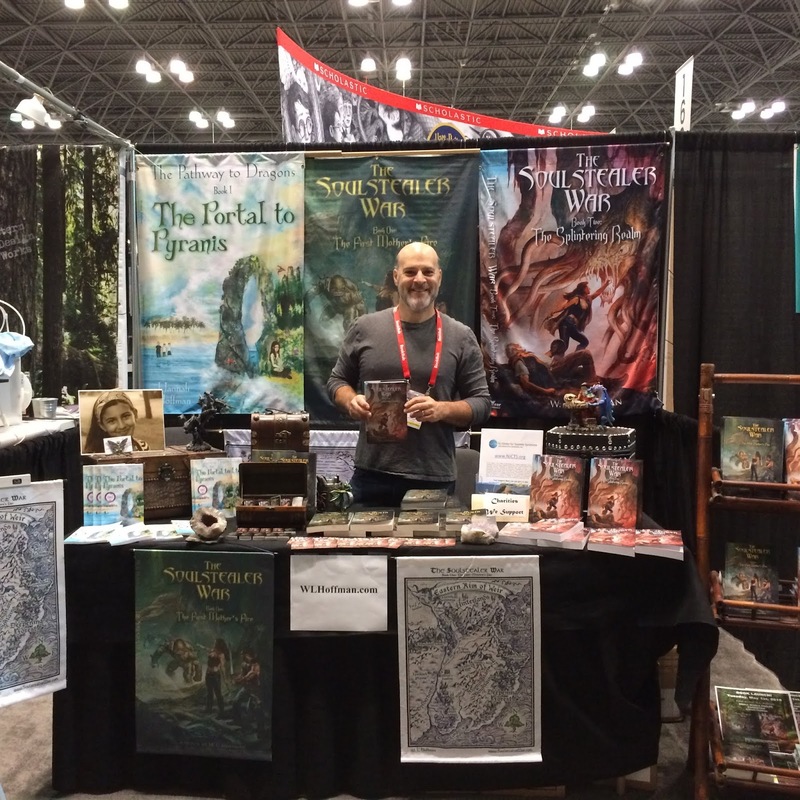 Soulstealer War - Writing the Fantasy Novel: The Soulstealer War and The Pathway to Dragons - Book Expo / Book Con 2018 Roundup! Insights on writing the fantasy novel, finding the right agent, and how to get published. Forum for fantasy and science fiction writers, readers, fans and artists. The Soulstealer War and The Pathway to Dragons - Book Expo / Book Con 2018 Roundup! 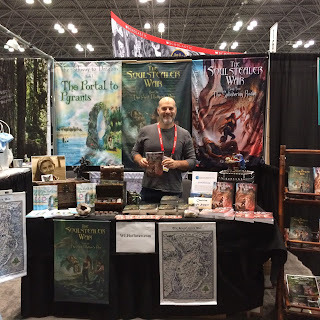 Waking pre-dawn to log the long drive each morning, and then returning late night exhausted, but oddly exhilarated, it was an honor to be an Exhibitor at this year’s Book Expo / Book Con! If you are launching a new book, you can’t miss this Show of Shows. Thus, the next installment of my fantasy and sci-fi series, The Soulstealer War: The Splintering Realm, carried me to New York City this past week. The Javits Center spectacle can be daunting, and it didn’t help that I was exercising rusty “Show” muscles. But what the heck, I always prefer the deep end of the pool! I love writing about the Realm of Weir - the characters, the creatures, the cultures, the folklore, the languages, the songs - but as an author, I also love meeting the readers. Give me a conversation, and I’m hooked. I come to the Booth with an open mind. This means I don't care who you are (and usually I can't tell until 10 minutes into a conversation anyway). Sure, I’m there as the point man for the Realms (Weir and my daughter’s Pyranis), but I also want to hear your story, your business, and your interests. Just as I sometimes delve into the nature of true magic (see my website), the only way a nexus will manifest is by letting the flow occur. I look for awareness in the folks who cross my path, and brief eye contact sends me into a flurry of possibilities. This flight of fancy then lands on firmer ground once the conversation begins. Book Expo was heavy on people seeking swag, signings, and freebies, and there is a balance to be struck. The Show doesn't really want you to be selling, but you can take orders and fulfill them amazingly fast! And there is always karma; I give away a fair share of books for goodwill and to see what the Universe will manifest. My Booth was by chance a stone's throw from the big players - Simon & Shuster, Baker & Taylor, Ingram, IPG, etc. - and I was a wee minnow in that sea, but there was an abundance of synergy. I met foreign licensing contacts, reviewers, librarians, printers, buyers, publishers, literary agents, marketers, translators, artists, designers, social media experts, radio folks, podcasters, authors (aspiring and established) and a few other wild cards. All good. This is a marathon, and not a sprint. I will abide; everything unfolds in due time. To the young women who live near the Appalachian Trail with the software coder who will find my website’s hidden access portals (without hacking it to shreds as promised) … your group rocks! To the pregnant mom who is an aspiring author - my hopes that you put one foot in front of the other and take the road less traveled - get your writing out there! This advice was a common theme as I met many unpublished authors, and I was happy to impart what wisdom (and foolishness) I could. I’ve been there. I get it. To Meg-a-Watt - thank you for a great conversation on fantasy, sci-fi and life. At first, I thought you said you were Megatron … then you added the “Queen Bee” to clarify, and I still apologized because that didn’t mean anything to me. Finally, you said you were LitBuzz, and helped further my information gap with discussion on how you began and grew that endeavor. To purple-haired Kristin and her dad - your spark is bright enough to set the world on fire - and that you read my book (and Hannah’s) that night after buying them, and loved them, and came back to tell me the next day at the Booth … there is no more amazing way to start a day as an author! To the man who was pushing his niece in a stroller, who was dragged to Book Con with his girlfriend and who never picks up books, let alone reads them … it was my privilege to hand you Book One and Two. The real reward was your girlfriend’s joy watching your willingness to venture into her world, and the long embrace you two shared a booth away. To Tim, the bow-tied literary guy, who now knows that my alter-ego wears a vest with a pocket watch, often topped in a worn Stetson hat, thank you for the chat and your advice on my Boris Vallejo/Julie Bell front cover banner. To Janine, author of The Puzzle Quests: Shimmer’s Eggs (and other books), whose son succumbed to cancer - your story is inspirational and our conversation will stay with me. To the librarians and teachers - there were so many - I wish I could have given you more free copies of Hannah’s middle school chapter book The Pathway to Dragons: The Portal to Pyranis - you have one of the hardest, thankless and yet, most important careers on the planet! That cannot be said enough. To the group of three teen girls who had their Mikey (a classic commercial, where one brother serves as the guinea pig for tasting a new cereal - and the girls had no clue on this dated reference) be the designated reader for any new book series - that you returned a short while after buying Book One to tell me that during the Show you read the first 50 pages and loved it, that the writing was awesome - thank you for that thoughtful gift. To my immediate Booth neighbors on either side of the Show floor - Cameron and Rebecca the jewelry gurus of Stern Design Works, and to Anne Wheaton (Piggy and Pug children's book author) with her outgoing publicist Susan Peters - your cheerful company was an unexpected pleasure! Though not a meeting, I need to give a shout-out to Dog Ear Publishing and founder Ray Robinson - your support during the Show was invaluable. And indeed, another Dog Ear author stopped by my Booth for conversation. Also, to Amy and Julie from Reed Exhibition, and Scott from Freeman – your assistance helped make my Show experience a success, and the Booth “check-ins” were greatly appreciated. Finally, as a reminder, a portion of our book proceeds are donated to The NJ Center for Tourette Syndrome, Special Strides, and The Bridge of Books Foundation. Any additional support you can provide to these worthwhile charities will make a difference! W.L. Hoffman - breathe slowly, observe humbly, dream deeply and evolve! W.L. Hoffman was born in the 1960’s in NJ. Hoffman’s interest in reading was voracious from an early age, with a keen taste for fantasy and science fiction. He took advanced English curricula through high school and received his BA in English from Duke University. He also attended English literature classes at New College at Oxford University in England. Following his introduction to legislative drafting while serving in the Duke University student government, Mr. Hoffman obtained his JD from Cornell Law School. While there, he edited and wrote as an associate on the Cornell International Law Journal. With his creativity under daily siege from the law professors, his dreams wandered into strange realms as he quested for life’s higher meaning. Thus was born the foundation for his first fantasy novel series, The Soulstealer War. Hoffman currently resides in NJ with his wife and daughters. When not plying his day job or writing at night, he enjoys spending time with his girls, digging in their organic vegetable garden, exploring the wilds of the nearby Sourland Mountains, and telling tales on the front porch to what he knows will be the next generation of dreamers and writers. Sir Richard Branson - Bravo! Smile When Your Child Says "No." Ground Control to Major Tom - Anyone Listening?